Everlast Pro Style Training Gloves Black 16 oz. Brand: RDXColor: BlackWeight: 10 oz. Half mitts gloves, empty palm, with nice flexibilty & prevent swea ting when train. T he back of glove and strap thicken foam, well protecting wrist. Designs for MMA or any boxing training. Note: due to the production batch is different, the letter printed on glove may be a little different with the photo, we will send it at random, hope you understanding. Pics are of the exact pair of gloves you will receive. The only thing you need to know about New Sporting that is that their leather is very grainy (like Casanova), it's top great quality cow leather, but not as spotless as Cleto Reyes. Great padding protection and response, do I need to say more?. For Sale is a pair of Winning Boxing Gloves. These gloves are 100% Genuine Leather. Gloves are black color and the pictures taken are the actual gloves you will receive. 16 oz Pro Type Tape Fasten. 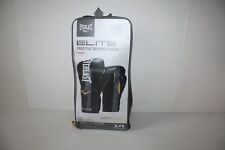 Ringside IMF Tech 16 OZ Super Bag Gloves Size L with Title Gel Hand wraps included. Excellent Condition. Shipped with USPS Priority Mail. Boxing pads: Tiger Muay Thai. muay thai boxing: boxe thai. sanda: muay thai pads. Model Number: boxing gloves. glove box: boxers gloves. Applicable People: Male. We will try our best to help you;. Machina Carbonado 14 Ounce Women's Leather Boxing Gloves - Baby Blue. Condition is Used. Shipped with USPS Priority Mail. DEAL!!! Boxing Gel Gloves Included FREE!!! Brand: RDXColor: BlackWeight: 14 oz. 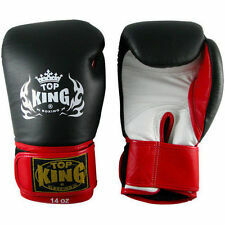 I hate the rental gloves that they had (mostly Fairtex and Muay Thai Gloves) so I ordered this pair of Winning from them. Took forever! 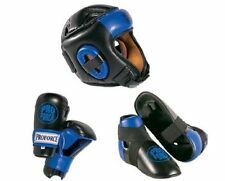 New Other Winning Japan MS-600B Hook & Loop Boxing Gloves 16 Oz. Rocky Balboa Everlast Boxing Gloves Sylvester Stallone Movie Rare! Brand: RDXColor: RedWeight: 16 oz. Revgear Krav Maga Leather Boxing Glove (Black) 16 Ounce! There are many different types of boxing gloves. Some are designed specifically for sparring while others are meant for bag training. Boxers of all types and skill levels will be able to find a pair of gloves that suits their boxing needs. What are the major types of boxing gloves? Bag gloves: Bag gloves are designed for lengthy bag sessions. They provide ample support to the hands and wrists, but they're not as heavy as training gloves. 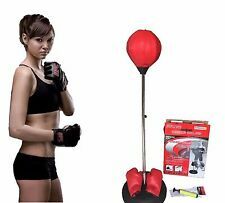 This makes them ideal for endurance boxing and lengthy bag workouts. Training gloves: Training gloves can be used for any kind of boxing. These heavy, foam-filled training gloves can be used for sparring sessions, bag training, and more. Because the extra padding offers wrist and hand support, training gloves are ideal for beginner use. Sparring gloves: These options have less padding than training gloves, and they are generally used by boxers who have advanced beyond the beginner boxing level. Sparring gloves are light enough for use during a prolonged sparring session but sturdy enough to provide protection for everyday sparring. Competition gloves: Competition gloves have little padding, and they're typically used by advanced boxers. They don't provide enough hand and wrist protection for ordinary sparring sessions or bag training. What are boxing gloves made of? Genuine Leather: Leather is the traditional material used for boxing gloves. High-quality leather has a number of benefits, including improved strikes and minimal abrasion. Over time, these boxing gloves will mold to the boxer's hand, which ensures a great fit. Synthetic materials: Some boxing gloves are constructed out of synthetic materials, like vinyl. Vinyl boxing gloves are a popular choice for beginners, and they have a number of benefits. They prevent the boxing gloves from catching on targets, and they help to absorb blows. Polyurethane leather: This leather substitute looks and feels like real leather, and training gloves made out of these materials are durable and easy to use. What sizes do boxing gloves come in? 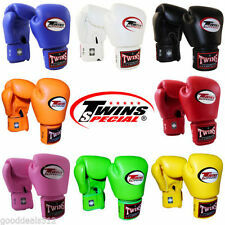 8-ounce gloves to 10-ounce gloves: Lightweight gloves are generally used for competitions. 12-ounce gloves: These light training gloves have enough padding for everyday sparring and bag training, but not so much that it slows punches and reflexes. 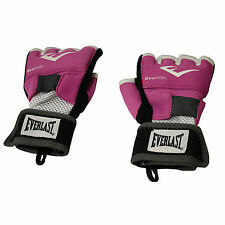 14-ounce gloves: These training gloves have a bit more padding, and they're often used by beginners. 16-ounce gloves: 16-ounce gloves are traditionally used for sparring. 18-ounce gloves: Larger boxers sometimes use training gloves that weigh 18 ounces or more to add extra weight to training sessions.